As my students know, the Official Guide to the SAT offers 4 real SAT practice tests. Two more, practice tests 5 and 6, (along with the original 4) are available through Khan Academy for free. Find them here at Khan Academy (you may need to log in) or here at the College Board. The SAT is more important than ever. It shouldn’t be. The test, like any standardized test, is coachable and beatable with the right approach. It is not an accurate measure of a student’s intelligence or a representation of how well a person will do in college. So why do colleges put so much weight on it? Imagine you are a junior in high school. (If you are, you won’t need to imagine!) Think about your US History class. Your teacher may be easier or harder than your friend’s teacher. A 95 in your class may not mean the same performance as a 95 in your friend’s class. So all things are not equal, even in the same class in the same school. Comparing students who take different classes with different teachers in different schools in different states with different curricula on the basis of GPA? It’s not comparing apples to apples. It’s not even comparing apples to oranges. It’s more like comparing wrenches to kiwis. (Two things that have nothing to do with each other.) The SAT, for all its myriad of faults, at least compares everyone on the same scale. This is why colleges have relied and continue to rely on it. But what about the whole SAT optional trend? There is a growing movement to make SATs optional and it has reached 280 schools. This is not what it appears to be. Think about it from the college perspective. The college’s goal is simple, yet complex. Assemble the best possible freshman class, with a diverse set of experiences and a high standard of academic, athletic, and extra curricular excellence. Colleges know that the more selective they appear, the better they will do recruiting top students. Selectivity is a simple math formula: number of admitted students / number of applicants. Admitting less students = less money for the college, so this is a non starter. Becoming more selective requires increasing the applicant pool. Applicants with poor SAT scores do not apply if they do not believe they have a chance to be admitted. Et voila! Make SATs optional and watch the applications roll in and selectivity increase, which leads to even more applications. Most SAT optional schools do not accept the vast majority of students who do not submit SAT scores. They do accept some. These are students who are so attractive to the college for their other indications of excellence (academic, athletic, or otherwise) that they would likely be admitted regardless of how low their SAT scores, and they might not have applied because they assumed their SAT scores disqualified them. This is why SAT optional policies are a win-win for colleges. Students with high scores still submit them, and colleges can have their cake and eat it too. 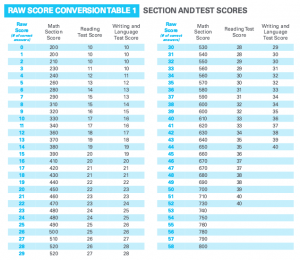 Additionally, the new SAT is more closely alligned with high school curricula and will let colleges pretend that it is more predictive of collegiate success than it really is for at least a few more years. SAT scores are also still the primary determinant of non financial need based scholarships, whether schools are SAT optional or not. In short, in spite of trends toward making the SAT optional, this highly coachable and beatable test remains as important as ever. Any student who wants to increase the number of college acceptances or the amount of scholarship money is encouraged to work hard to improve his or her score.